Recently, I've started using more fleece which really gets pushed down in the cuts of my self-healing rotary cutting mat. I decided to take it to the laundry room tub thinking that wetting the material would "loosen" it. This did not work very well so I then scrubbed it with a nylon brush trying to get the material unstuck from the cuts. I decided that I would eventually ruin my mat/scrub off the cutting lines if I kept doing that. Previous to this water scrubbing technique I did Google 'how to clean a rotary cutting mat' and the only advice I could find was to use a sharp blade in my cutter; which is very true, but not the answer I was looking for. One day I was cutting more fleece and the fleece was once again sticking into the mat and I suddenly had a "clever" idea to clean the mat. 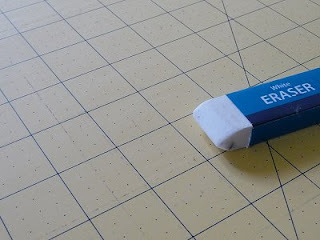 So over to my desk I bound and grabbed a generic white eraser block. 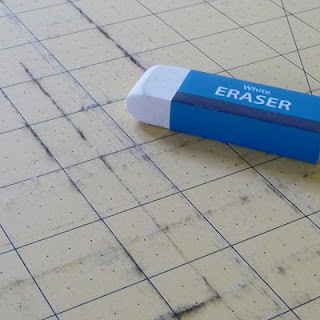 Yeah, the kind you use to erase pencil lines. 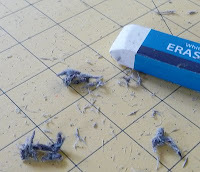 I rubbed/erased a spot and was in total glee that the eraser grabbed the fleece from the cuts. I danced and skipped around my stacks of fleece and baskets of yarn. Whirling with delight, I just knew I had to share this "secret"... with YOU! Dritz Dual Rotary Blade Sharpener - a worthy investment! I never thought about that, you are so smart. I'm glad you said something about the sharpening tool, I thought I was going to have to go buy a new blade and WAS NOT excited about that. Thanks! Clever idea! I definitely need to try this! great idea---will have to try it out! thanks for sharing your brilliant idea. Thank you for this...I was searching for the same- how to get rid of fleece out of my cutting mat!. People like you make my world a wonderful place...Also never knew about the sharpener...great tip. Will be looking out for the next notions sale or I get a coupon! Thank you for this...I was looking for the same- how to get rid of fleece out of my cutting mat! People like you make my world a wonderful place. Also great tip on the sharpener... did not know that. Will be looking out for the next sale to buy it! They make special cutting mats for fleece that don't make the lint stick. That might be an idea if you use a lot of it. ;-) I found one at Goodwill for dirt cheap! Thank You so much for this idea! I have been cutting felt on my board and had tried everything to get the fibers out. I went right to my board and tried this and it is wonderful! Thank You again! graciaaaaaaaaaaaaaaaas, ya lo voy a probar.